Being a wedding photographer who works in and around Pasadena enables me to truly take advantage of the stunning architecture that this beautiful city offers. From Arlington Gardens and the Los Angeles Arboretum to the hidden alleys behind Colorado Boulevard, Pasadena offers endless locations for beautiful engagement sessions, pre-wedding sessions and family portraits. 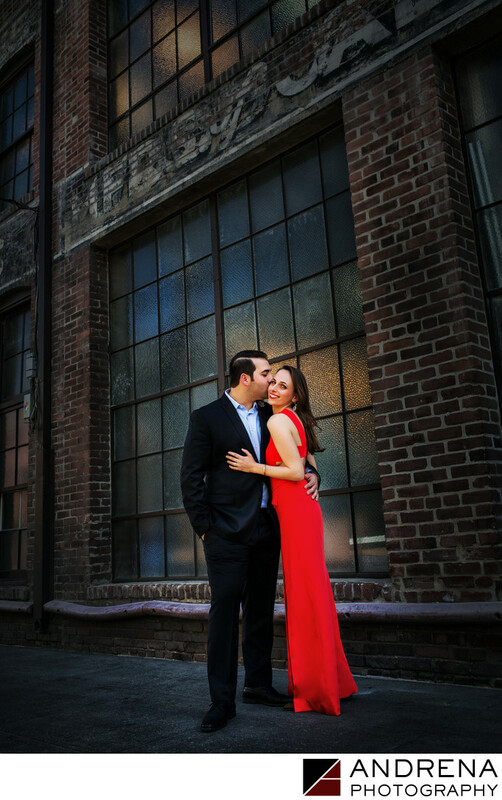 This beautiful brick building is one of my favorites, and I thought it provided a perfect backdrop for my stylish clients. Creative Photoshop and post-processing helped bring this image to life, as I really wanted the bride's red dress to pop. The couple framed this image and I loved seeing it on their wedding day. Wardrobe choice is always key to beautiful engagement and pre-wedding sessions. I always encourage my couples to think stylish, think glam and think dressy. Pops of color also help images come alive.